When Christmas was approaching with my first baby, it suddenly dawned on me that I needed to get him a Christmas stocking. I couldn’t imagine buying one from the store. Mine is still the one my mom made me. My husband said his mom made his. I had to make this baby! Up until this point, I had only made one quilt. 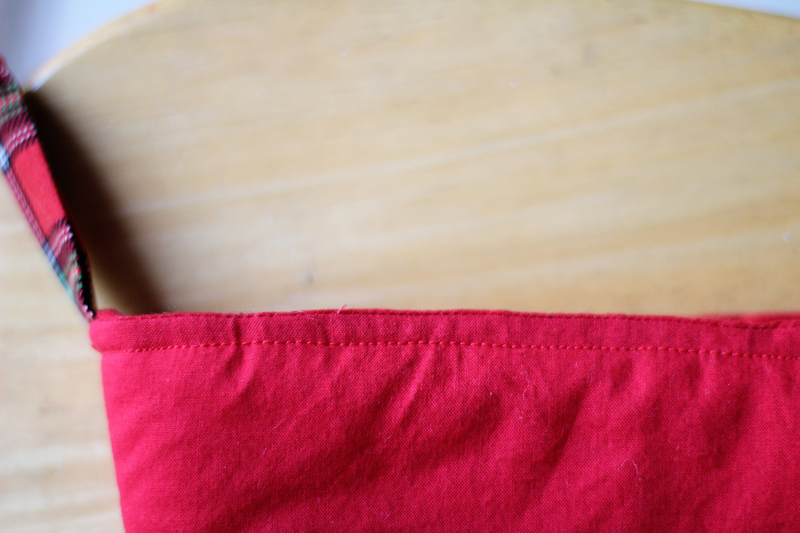 That was the extent of my adulthood sewing experience. I liked my husband’s stocking, so I was going to make it with similar materials and technique. I have little creativity, so I let Hubby design the shape. The pictures below are from my third son’s stocking, before my tutorial days, so I apologize for the gaps and poor photography. I’ll be sure to talk you through this. 1. 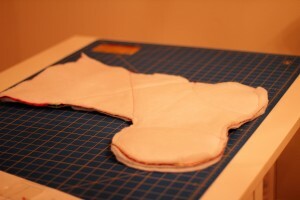 We started by drawing the shape of the stocking (including seam allowance) on a big piece of paper. I cut that out to use as a pattern. 2. I put the pattern over the fabric that would be the body of the stocking. I didn’t cut all the way to the top, as I knew I was going to do the top in a different fabric. 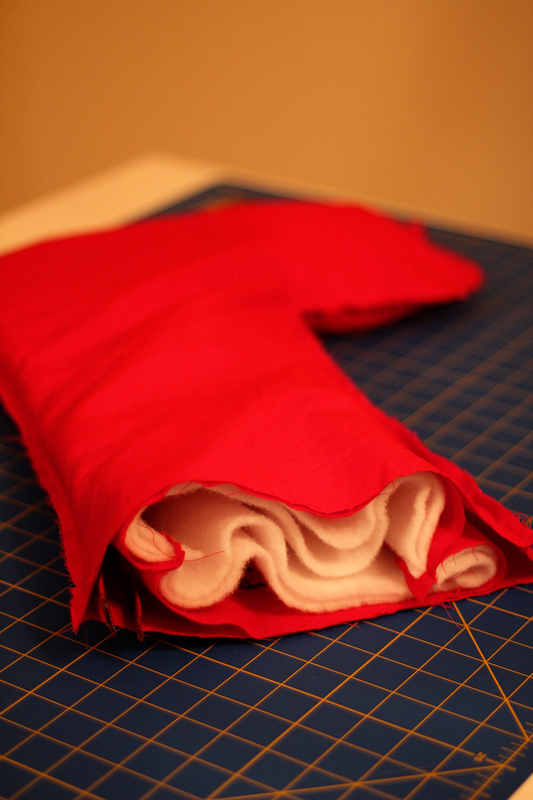 I made sure I cut high enough for a seam allowance along the top for the cuff. 3. I used the pattern to cut the cuff/header portion of the outside, keeping to the shape of the pattern, and creating a seam allowance to attach to the main body. 4. 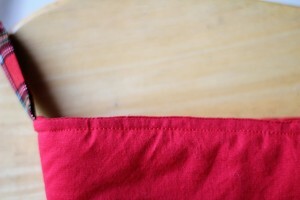 I cut a strip of double-folded bias tape to use as trim, to be sewn between the cuff and body of the outside. 5. I placed the cuff and body, right sides facing each other, and slipped the trim in between them like a sandwich. 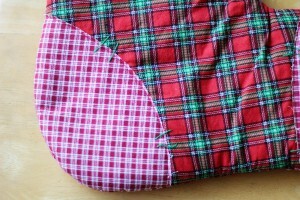 I lined up all their edges and sewed them together. 6. I used embroidery thread to stitch the name onto the cuff of the front. 7. 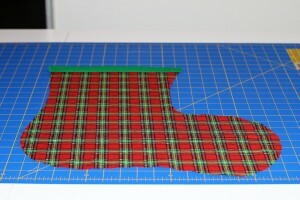 I used the pattern to cut heel and toe patches from my accent fabric. 8. 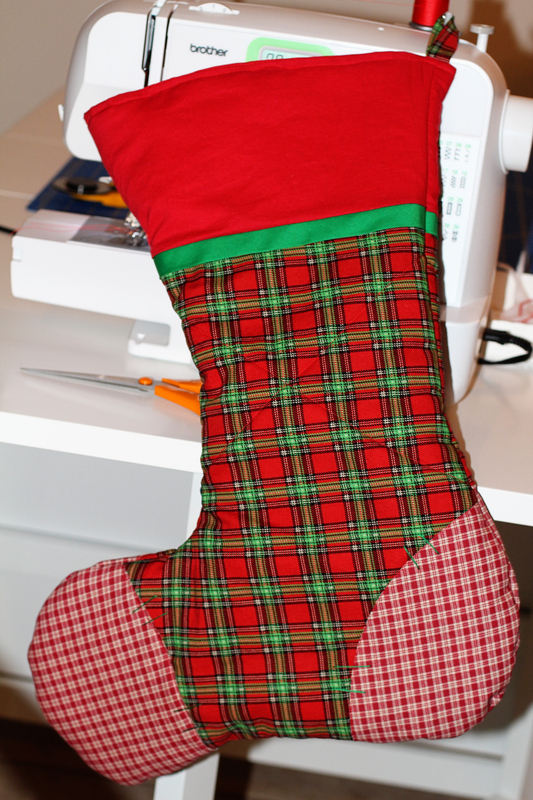 I put the pattern on the batting and cut the full shape of the stocking, leaving seam allowance. 9. I put the stocking-shaped batting piece and lined it up against the wrong side of the outer stocking. 10. 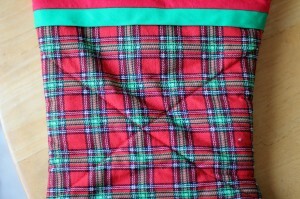 I sewed across the entire outer stocking and batting, making an X to quilt the pieces together. 11. 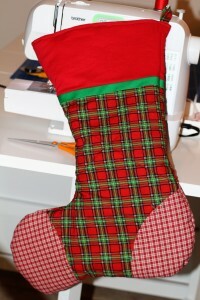 I sewed the patches onto the heel and toe areas of the outer stocking, leaving an unfinished ¼” edge. 12. 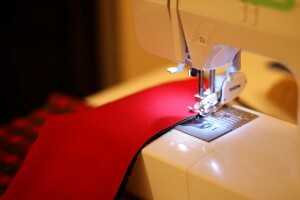 I used embroidery thread to sew large, exaggerated stitches around the patches on the outer stocking. 13. 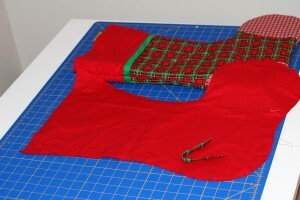 For the back of the outer stocking, I repeated steps 2 through 12 (omitting step 6). Be sure to FLIP the pattern so the toe points left before cutting. 14. 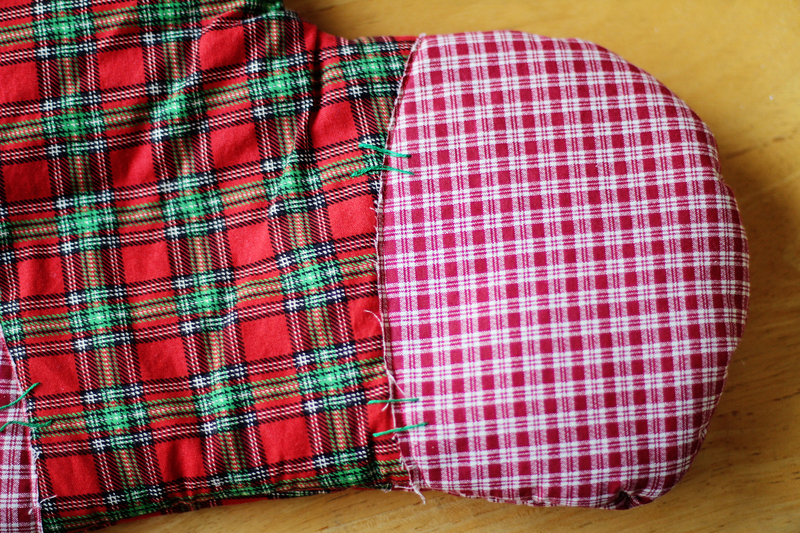 With two complete outer pieces, right sides facing, I sewed them together along the sides, but not the top. 15. 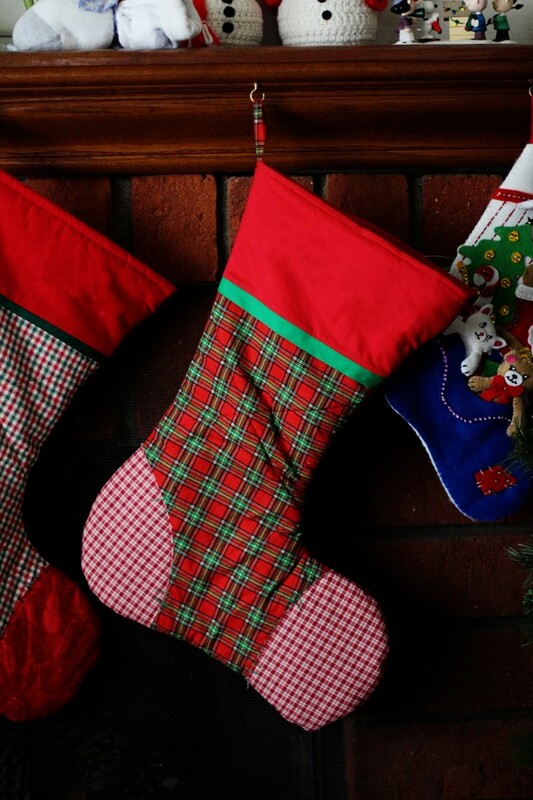 I turned the outer stocking right-side out. 16. 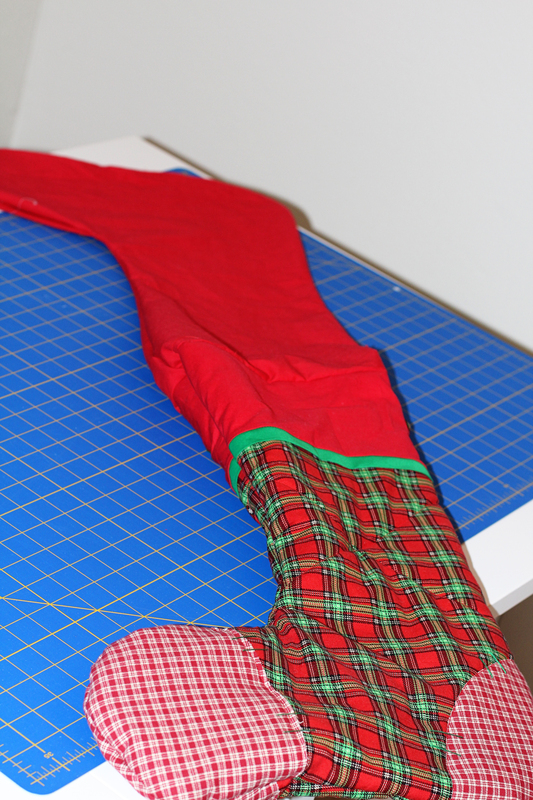 I placed the pattern on the fabric I chose for the lining of the stocking, and cut two pieces. 17. 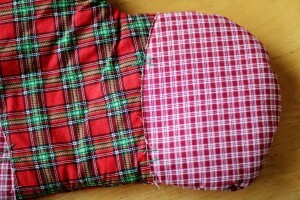 I sewed along the edges of the lining pieces, leaving a hole at the bottom to later pull the stocking through, and did not sew across the top. 18. 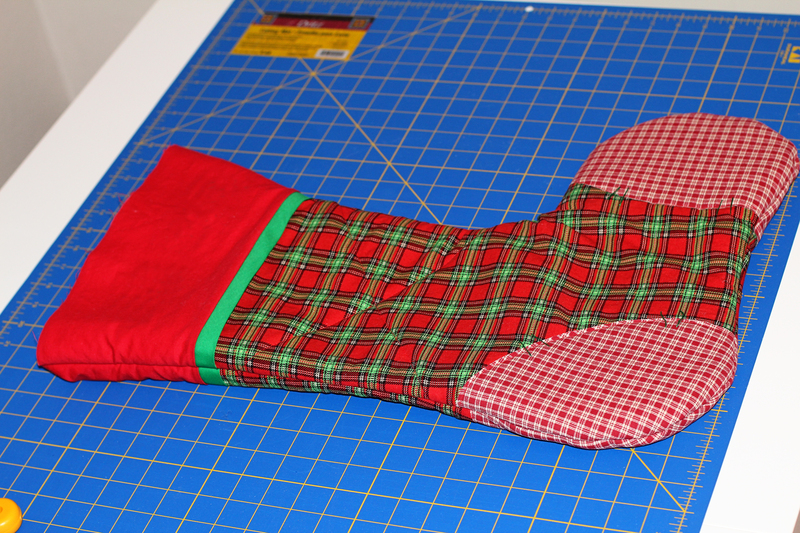 I cut a piece from my excess fabric I used for the outer body of the stocking. 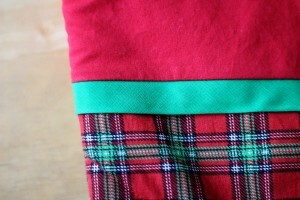 I sewed it into a tube that would later be folded into a loop to hang the stocking. 19. 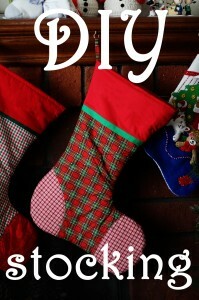 I stuffed my right-side out outer stocking into my inside-out stocking lining. 20. 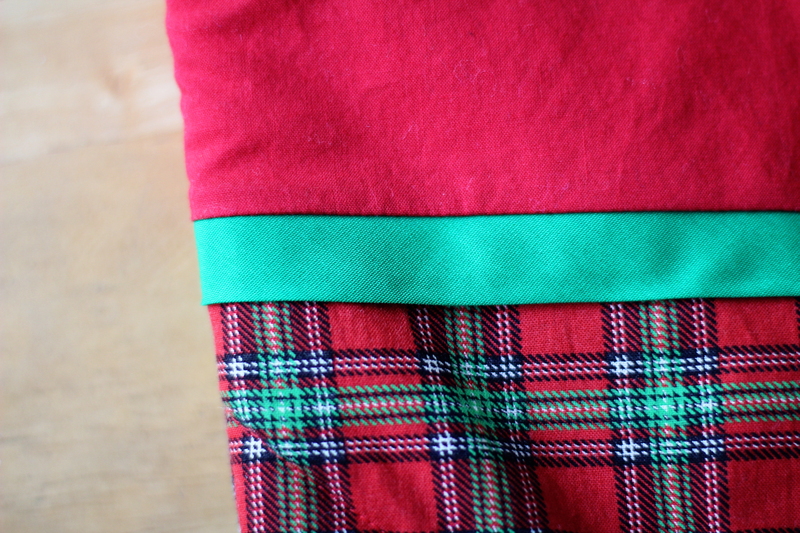 I lined up the tops of the outer stocking and stocking lining and sewed all the way around, placing the tube I made in the shape of a loop sandwiched into the seam. 21. 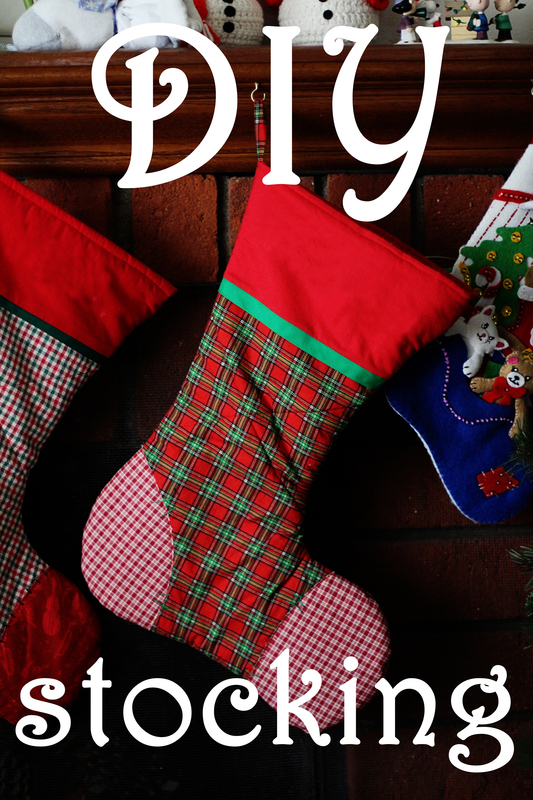 I pulled the outer stocking through the hole in the lining. 22. 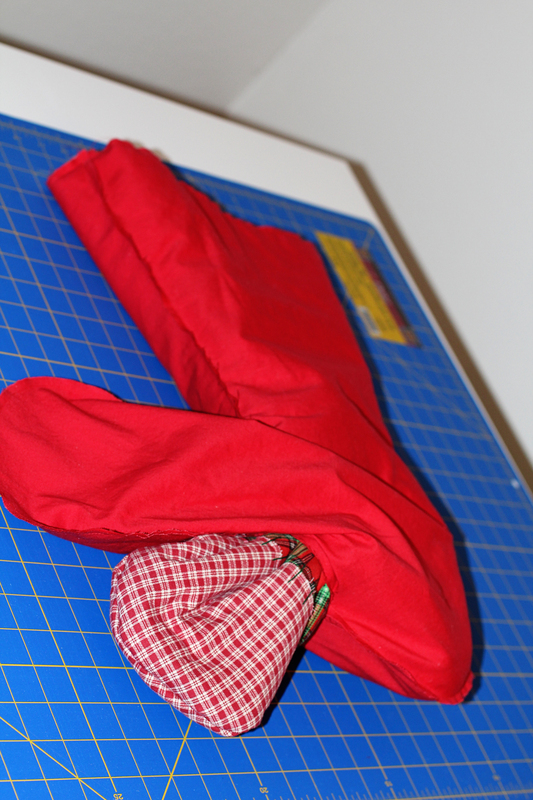 I stuffed the lining into the outer stocking. 23. 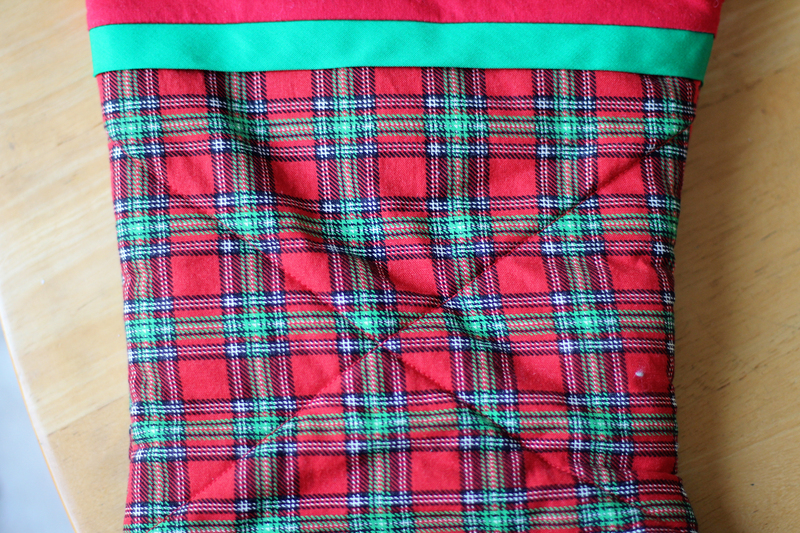 I top-stitched around the top of the stocking. The steps can be confusing if you don’t have them planned out ahead of time, so I hope this helps. Have fun stylizing with your own embellishments. I’d love to see them!